Established in 1809, this predominantly rural county is home to several small towns including its county seat, Jeffersonville. The population of approximately 10,000 includes almost 4,000 households. 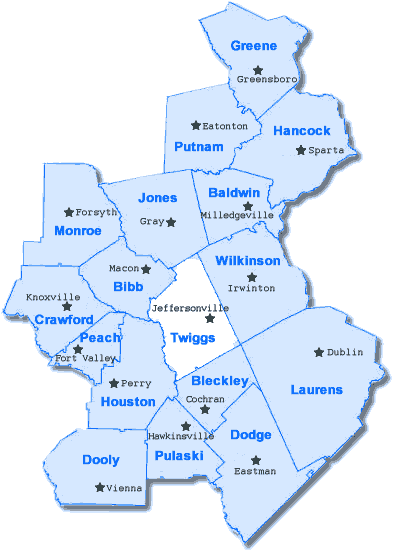 Twiggs County is said to be in the exact geographical center of Georgia and covers 363 square miles of land area. Its principle industries are farming, forestry and the mining and processing of kaolin. This rich white clay is used extensively in the manufacture of paper, paint and makeup. Easy access to Interstate 16 provides quick access to the city of Macon as well as a convenient route to the Georgia coast. Are you relocating to Jeffersonville GA? Get your FREE relocation package!